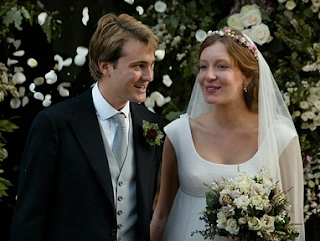 At the 2003 society wedding of Kate Rothschild and Ben Goldsmith, it appeared the young couple had the world at their feet. The groom was dashingly handsome in traditional morning suit, the pregnant bride pretty and coy in a flowing white gown, a wreath of fresh flowers adorning her long dark hair. Ten years ago, Goldsmith was named Britain’s most eligible bachelor by Tatler. Known as Ben-Ben by his family and born when his mother was 46, Goldsmith provided solace for Lady Annabel when her first-born son, Rupert [by first husband Mark Birley], disappeared off the coast of West Africa while swimming in 1986. Originally posted on March 25, 2011.